Sunflowers are the gardener’s ultimate “feel-good” flower. They can be incorporated into the landscape to brighten up the flower garden or the vegetable garden, or to just stand alone in their own magnificent glory. And, how can you not love a flower that’s named in honor of that great life-giving energy source that is at the heart of the photosynthetic activity that promotes plant growth and the production of the oxygen that is essential for our own human existence? 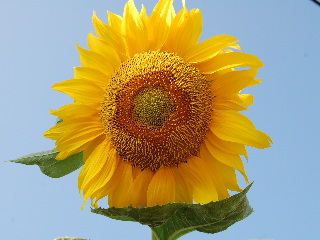 From their place in the art world by way of the famous paintings of sunflowers by Vincent Van Gogh to their incorporation into the gardening world and into the world of healthy eating (sunflower seeds and sunflower oil), the humble sunflower adds much to our daily quality of life on this planet. If you want to add sunflowers to your home garden, they’re just as easy to grow as they are pretty to look at! 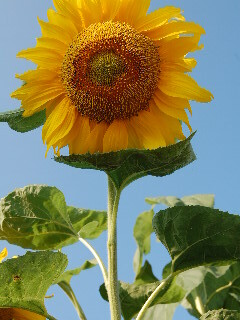 Plant your sunflower seeds outdoors directly into the garden soil after all danger of frost has past. They won’t do well if you try to start them indoors with the idea of transplanting later on into your garden. Remember to situate your sunflowers in such a way that they will not crowd out or shade out other nearby plants or flowers—they’re gonna get pretty tall as they mature! A row of sunflowers at the edge of your vegetable garden adds a nice touch and it’s fun to watch them grow and to enjoy the beauty of their blooms throughout the season as you tend your garden during the summer months. A loose, loamy, well-drained soil is ideal, but sunflowers are not overly demanding of soil types and will grow and produce plenty of glowing yellow flower heads in less than ideal conditions. What they do need (and this should come as no surprise) is a site that receives plenty of sunshine—full sun for most of the day is just about right! The flower heads will always face east, in spite of the fact that some people think (incorrectly) that the heads turn throughout the day to follow the movement of the sun. Once the plants are up and established, they are not demanding of moisture either—often surviving and thriving in near-drought conditions. As the flower heads begin to mature and their seeds begin to dry, the wild birds will find them and enjoy their nutrition. If you see this beginning to happen and you want to save the seeds and eat them yourself, cut the heads, bring them indoors for continued drying, and harvest and roast the seeds for your own enjoyment. One of the most beautiful and useful plants native to the Americas, sunflowers are now among the most popular annuals planted throughout temperate regions of the world.